Clothing brand Timberland has called upon agency Sense to educate festival-goers at this month's Camp Bestival (28-31 July) about its environmental commitment. Sense has created a self-sufficient interactive experience, known as the Timberland Earthkeeper Power Camp, where revellers can create their own energy to make drinks, charge their phone, and listen to music. The experience was debuted at Cornbury Festival earlier this month, and saw consumers running for two minutes on a log roll to power the kettle for and hopping on a bike and using pedal power to blend their own smoothie. All energy generated is fed back into the giant camp battery to power the lights, PA system, kettle, sink pumps, ipads and mobile phone chargers. The experience will also showcase products from the brand’s Earthkeepers range, with online portals giving them the chance to order online. "We specifically selected both Cornbury and Camp Bestival music festivals for this activity owing to their higher proportion of ABC1 consumers aged 25-44 and their more relaxed, family friendly atmospheres," said Sense Group account director Mel Lalou. "We felt these environments would lend themselves perfectly to engaging Timberland’s core audience in a fun and memorable way than some of the summer’s other festivals. 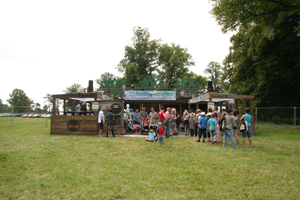 "Whilst they’re great opportunities for many brands, the audience fit needed to be right for Timberland and after seeing the way festival goers interacted with the experience at Cornbury, we were blown away by their huge eagerness to take part and fantastic feedback we received. We can’t wait to take the Powercamp to Camp Bestival at the end of the month."